S. K. Collection, Germany, 1984. Apollo is one of the most important and intriguing deities of the Graeco-Roman pantheon. Born to the king of the gods, Zeus, and Leto, his sister was the hunter goddess Artemis. His role and associations were manifold, and he was recognized variously as the god of music, prophecy, truth, healing, archery, plague, medicine, sun and poetry. It was perhaps his breadth of power and his ability simultaneously to bring about good and bad that made him such a venerable deity. This cast bronze miniature head with a dark green patina presents the god with a serene, yet authoritative countenance. The artist has skillfully crafted a coiffure of tight curls, gently arcing eyebrows, a fixed gaze and a stern mouth, which combine to produce the youthful beauty yet forbidding presence for which the god was renowned. The Romans adopted the worship of Apollo from the Greeks but attributed to him their own significance. They first built a temple in his honour in 430 BC, but it was during the time of Augustus, who claimed special protection from the god, that he truly became one of the principal gods of the Roman pantheon. With his multifaceted capabilities, Apollo was a popular choice in public and private settings. 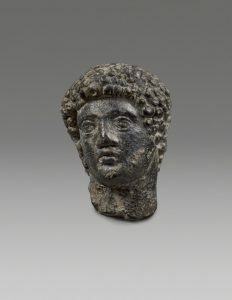 This bronze originally had a flat base and was solid cast, indicating that it probably functioned as a weight for a scale to weigh natural produce. As such, it may have belonged to a shopkeeper or a trader.